Aaron Rodgers' injury has basically sunk the Packers' season. Absence makes the heart grow fonder. This is a cliché. It is also, in many cases, completely incorrect. And then there’s Green Bay. Since Aaron Rodgers broke his collarbone November 4, the Packers have seemed like an entirely different team. In the most basic measure, they’ve fallen from 5-2 to 5-6-1, or from a Super Bowl-contender to a team that will, barring winning out the rest of their schedule, stay home during the playoffs. To get a little more specific, take Football Outsiders’ DVOA stat, which basically measures a team’s effectiveness compared to the league’s average team, adjusted for the quality of their opponents. After Week 7, the Packers were the league’s fifth-best team by DVOA, trailing Denver, Seattle, Indianapolis, and Kansas City. Then Rodgers was injured. Fast forward to now, and the Packers have fallen to 21. Rodgers’ absence isn’t the only issue the Packers have been dealing with, but in the past, his presence has more or less insured that, no matter what other injuries struck the team, they would remain a playoff-quality squad: there’s no better proof of this than reaching four straight postseasons, including one Super Bowl ring. Without him, not only are they sub-playoff quality; they’re below-average. And while they have the excuse of unfamiliarity, and also not being good, they don’t have the excuse of lacking weapons; Jordy Nelson, James Jones, and Jarrett Boykin have been available, though Jermichael Finley is still recovering from a major spinal injury. So, that leads us down another path. Aaron Rodgers’ skill and ability has never been in question, solidified by his Super Bowl-champion 2010 season and his MVP campaign in 2011. But in a league that has been dominated for a decade by Tom Brady and Peyton Manning, it still sometimes felt as though Rodgers was regarded begrudgingly as an elite QB. He might be the best quarterback in the league at that moment, or for that year, but he still paled as an historic player in light of the Brady/Manning tandem. It didn’t help that Rodgers didn’t have such a perfect foil as those two had in each other. He occupied a weird middle ground: better than his contemporaries, the Ben Roethlisbergers and Eli Mannings and Tony Romos of the world, but always chasing Manning and Brady in terms of accumulated career accolades. (Drew Brees can relate a little: he was the odd man out before Rodgers.) There can only be so many era-defining quarterbacks at once, and rightly or wrongly, Brady and Manning seem to have had those roles for a decade. But the Patriots were able to endure with a vastly inferior Matt Cassel filling in for Tom Brady during his lost 2008 season, going 11-5. That was a better team than this Packers squad, but it was also a testament to the fact that Brady had players around him who were capable of carrying a squad in his absence. In Rodgers’ absence, the Packers have had no recourse: they tied the lowly Vikings, and a loss to the woeful Falcons this weekend would be a new low. 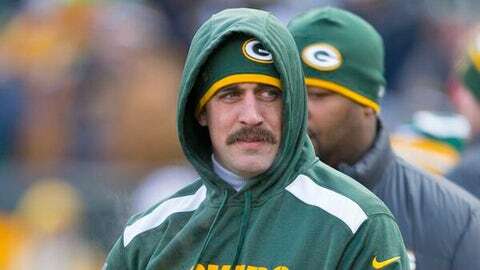 And so Rodgers’ injury may be the final factor in cementing his legacy. He’s a Super Bowl winner, MVP, and statistical dynamo. And without him, his team is a disaster.